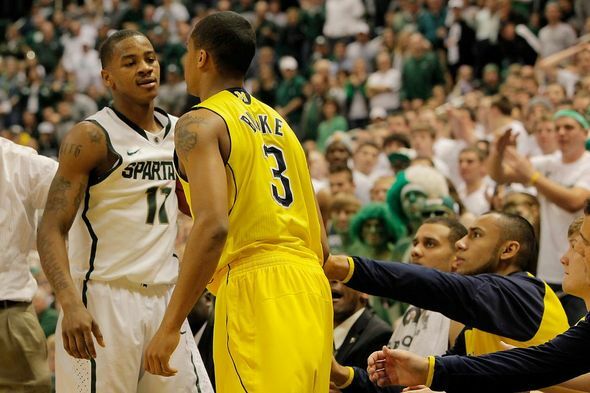 Posted on Wed, Feb 29, 2012 : 3:44 p.m.
Michigan State's Keith Appling, left, and Michigan's Trey Burke share some words late in the Spartans' 65-55 win on Feb. 5. The Wolverines wouldn't mind sharing a Big Ten title with its biggest rival. John Beilein tried all last week to avoid scoreboard watching. But Tuesday, while he was on the road, the Michigan basketball coach couldn't help himself. "I was out recruiting last night," Beilein said Wednesday. "But it's amazing what the phone can do." Beilein, who was reportedly in Indianapolis watching 2013 commit Zak Irvin, paid close attention to his cell phone and followed along as Indiana knocked off Michigan State, closing the Spartans' Big Ten lead and opening one final door for Michigan's hope for a split Big Ten title. "So you're telling me there's a chance," Beilein said with a smile. "That's exactly what's happened, there's a chance." For Michigan (21-8, 11-5), yes, there's a chance. With Michigan State's loss, the Wolverines have one last shot at raising a Big Ten title banner for the first time since 1986, but there's still plenty of work left to be done. Michigan has to win its last two regular-season games, beginning Thursday at Illinois (7 p.m., ESPN) and ending Sunday at Penn State (1 p.m., ESPN). The Wolverines also need Ohio State to knock off Michigan State (who has already captured at least a share of the crown) in East Lansing, on senior night, on Sunday. If all that happens, the Wolverines will earn a share of their first Big Ten title in 26 years. And though it's not an out-right crown, for the banner-starved Michigan program, a shot at a split is more than enough. "It's definitely better than nothing and it's a chance to put a banner up," Michigan sophomore forward Jordan Morgan said. "(And it's a chance) to prove that we're on the right track as far as building this program. "We just want to win a championship." After dropping a disappointing 14-point decision to Purdue in Crisler Center last Saturday, the Wolverines' shot at any type of league crown seemed distant at best. And though there's still plenty of work left to be done, and Michigan isn't in complete control of its own fate, it still has some hope to work with. Which, again, is better than nothing. "We've got to control what we can control," said Michigan junior guard Matt Vogrich, who watched the Michigan State-Indiana game with roommate Blake McLimans. "We're still right in the hunt, and now we've got two games. And we've got to take care of business. "It does give us a lot of hope." That hope won't last long, though, if Michigan can't go on the road and knock off Illinois on Thursday. The Illini have lost nine of their last 12 and coach Bruce Weber is seemingly fighting for his job at this point. However, Illinois found some life Sunday in an 11-point win over Iowa, and has been relatively tough at home this season. Illinois has already beaten both Michigan State and Ohio State in Assembly Hall, and Thursday will serve as senior night, meaning Michigan's quest to make the most of that final Big Ten title shot won't be easy. Even if the Wolverines can pull it off, they'll have to share their glory with one -- or both -- of their biggest rivals. But Beilein doesn't care about any of that right now. He's just happy to have a chance. "Would you like to win a conference championship outright, yeah," Beilein said. "But if you're co-champs, or tri-champs, or quad-champs, I don't care, (you're) champs, and that's what we're trying to get to. "We control part (of our own destiny). We'll just do our best, and we know there's a chance." Thu, Mar 1, 2012 : 5:26 a.m.
Coach JB should stop paying attention to what the other team does more than winning the rest of his games. If the team focused on Purdue more than the senior night thing, then UM is more nearer to a championship. Of course UM has a shot now, IF UM will focus on beating Illinois and Penn State on the road back to back. OSU has a realistic chance of winning against MSU, but that game is not within UM's control. Just win both games and hope OSU wins. Thu, Mar 1, 2012 : 2:11 p.m.
First of all, the writing in your post is awful. Secondly, based on JB comments leading up to any game this year, I don't think they have been scoreboard watching. The team came out flat and played a good Purdue team that didn't miss much even with a hand or body in their face. I don't think we as fans need to worry about a lack of focus from this team. They simply didn't play well for that game.